This 10-minute free audio practice guides you through a Sun Salutation flow that is adapted for greater ease and accessibility, especially for those with wrist, shoulder, hip or knee issues that make arm balancing and getting up and down off the ground uncomfortable. Plus, download a free PDF flow chart! 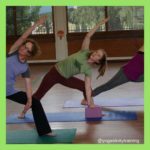 A great modification for people with joint issues that prevent you from bearing weight in your arms, or getting up and down easily off the ground, or anyone wishing to explore a new variation on an old favorite, Surya Namaskara. Add the ‘No Wrists’ Sun Salutations to your practice or teaching today!